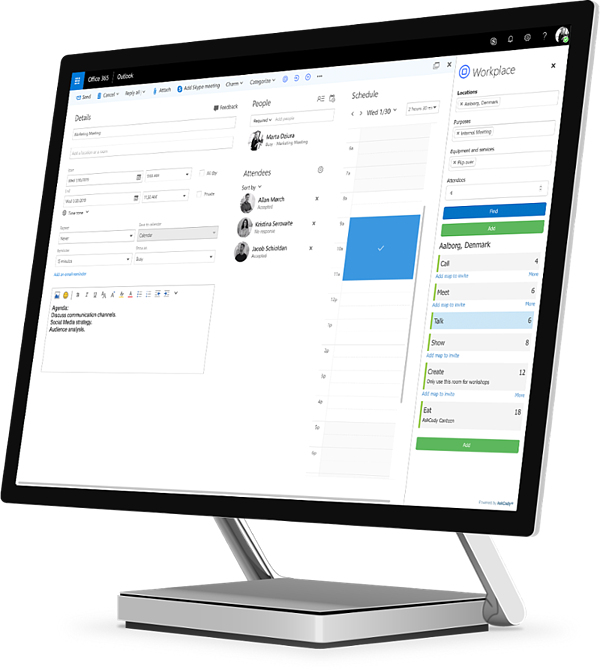 Streamline labor-intensive tasks related to meetings through Outlook and Office 365 with AskCody Workspace Management, Visitor Management, and Office Wayfinding. For many companies, a flexible workplace environment with the right management tools is vital to their future success. Anything that helps people to book and manage hot desks, huddle rooms, meeting pods or conference rooms efficiently and with a constant overview could save thousands per day and enhance productivity immediately. AskCody is the best way to book and manage your meeting rooms and all associated services and activities. The platform is intelligent, easy to use and comprehensive. Our fully integrated solution with Microsoft Outlook, Exchange and Office 365 will help you maximize workspace usage, efficiency, and collaboration, while providing all the intelligence you need to adapt to changing usage patterns to maximize use of your workspace. A walktrough of the AskCody platform and employee focused meeting tools to empower employees to achieve more. A deep dive into how the AskCody Workplace Insights tool for analytics and reporting gives you the answers you need about workplace utilization. A tour of the AskCody Management Portal for Meeting Managers, Receptionist, Facilities Management and Service Vendors to understand how AskCody enhance operational efficiency across your organization.